A parklet is a small pavement extension, usually extending one or two car parking space lengths, often appearing to be a miniature park (hence the name). It uses non-permanent material such as timber and combines elements such a boundary enclosed space, decking, planter boxes and planting, seating, bike parking and signage. Parklets are intended to be publicly accessible and provide space for people to sit, relax and enjoy the area around them, especially where narrow pavements would otherwise preclude such activities. Who can use a Parklet? As a parklet is a public space that can be used by everyone. It is not a private property and it is not limited to customers of the surrounding business. Each parklet has a sign on it clearly indicating that it is a public space. What are the benefits of parklets? In other cities around the world parklets have added much-needed green open space to dense urban environments. Anyone can sit down to eat or read, rest a while and look around as they notice the variety of things to do and places an area has to offer. In San Francisco, parklets increased peoples’ sense of a neighbourhood’s character from 80% to 90% as well as increasing foot traffic, particularly during week days and they encouraged people to linger longer in an area (and all without increasing anti-social behaviour). 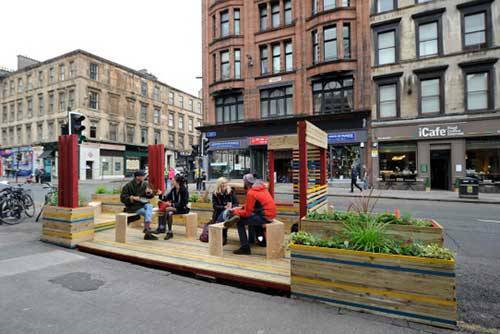 The first Glasgow Parklet was designed by Ice Cream Architecture in collaboration with its local host the Centre for Contemporary Art and it was positioned in a loading bay between 340 – 344 Sauchiehall Street. Ice Cream Architecture were part of the Stakeholder Engagement Team for the development of the Regeneration and Garnethill District Regeneration Framework. 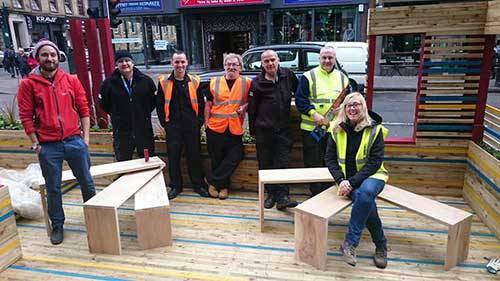 The Parklet was built by Community Safety Glasgow using their Community Pay Back Scheme using where they can reclaimed timber. It was a cross departmental collaboration, with Land and Environmental Services (Parks and Roads) providing assistance with permits, coning off the loading bay, installation of the parklet and also providing the planting. 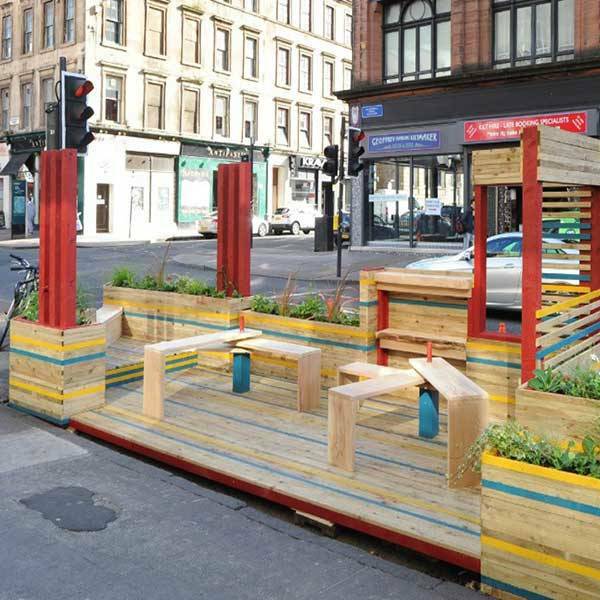 Community Safety Glasgow also provided CCTV monitoring of the parklet during its pilot period of 2 months. The planters and plants from the parklet have been successfully relocated to the Garnethill Multicultural Centre on Rose Street with the help of Community Safety Glasgow, LES Parks and LES Roads. 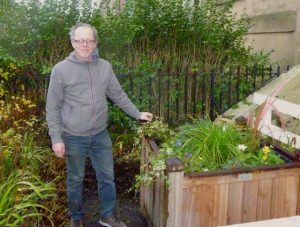 The plants would never have survived a winter of storage so we are delighted that they have found a new home in the heart of the local community.